Boeing Integrated Defense Systems President and CEO Jim Albaugh addresses the audience at the Boeing St. Louis 70th anniversary celebration on Aug. 27. Click here to view video comments by Jim Albaugh. Click here to view video comments by John McDonnell. Click here to view video comments by Christopher "Kit" Bond. Click here to view video comments Claire McCaskill. Click here to view video comments by Robert Soutier and Gordon King. Click here to view video comments by Russ Carnahan. ST. LOUIS, Aug. 28, 2009 -- Boeing Integrated Defense Systems President and CEO Jim Albaugh addresses the audience at the Boeing St. Louis 70th anniversary celebration on Aug. 27. Hundreds of Boeing employees were joined at the site by community leaders, politicians, company executives and others to celebrate the anniversary of James S. McDonnell founding the company that for decades bore his name and is now part of The Boeing Company [NYSE: BA]. 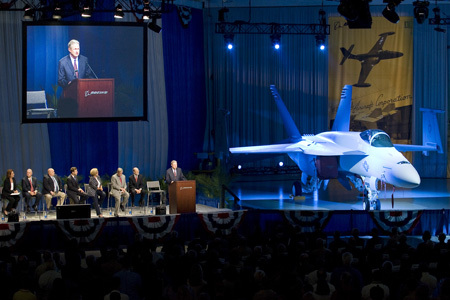 The ceremony also highlighted production milestones for several Boeing products built in St. Louis, including delivery of more than 1,600 F-15 Eagles; 400 F/A-18E/F Super Hornets; 200 C-17 subassemblies; 220 T-45 Goshawks; 220,000 Joint Direct Attack Munitions; 7,000 Harpoon missiles and 4,000 Small Diameter Bombs. Seated behind Albaugh from right to left are former Chairman and CEO of McDonnell Douglas Corporation and current Boeing Board of Directors member John McDonnell, Sens. Christopher "Kit" Bond and Claire McCaskill, Rep. Russ Carnahan, International Association of Machinists and Aerospace Workers District 837 President and Directing Business Representative Gordon King, St. Louis Central Labor Council President Robert Soutier, and Department of Economic Development Representative Linda Martinez. Click the below links to watch videos of their speeches. Boeing Integrated Defense Systems is the largest manufacturer in Missouri and the state’s second largest employer, with approximately 16,000 employees.